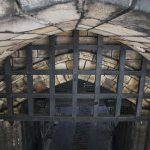 The City’s most iconic landmark has been revealed once again this week, with the removal of scaffolding and hoarding from Lancaster Castle’s John O’Gaunt Gate on Castle Parade. Over the past 12 weeks, the Gatehouse has been carefully screened from view while its stonework, ironmongery, timbers and pointing have been painstakingly repaired by skilled craftsmen to ensure the long-term preservation of its historic fabric. Now completed, the conservation work has included the installation of a new stone plinth underneath the famous John Of Gaunt statue which stands guardian over the city and its visitors. Work is now proceeding on the adjacent Governor’s House as part of the Duchy of Lancaster’s drive to protect and preserve the Castle buildings by making them water-proof, weather-tight and structurally sound for future generations. Working with Lancaster City Council, the Duchy has also planted some 40,000 bulbs on Castle Hill, many of which are already in flower. Designed by local landscape architect David Redmore, the planting scheme is designed to provide a constant display of colour along the front and side of the Castle. Formal borders lining the approach route are due for planting later this month. 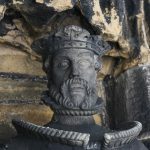 John Of Gaunt is not the only statue at Lancaster Castle to prove popular with Lancastrians. Earlier this year, the ‘Justice’ statue on the Female Penitentiary (C-Wing Panopticon) was selected as one of the items for ‘Lancashire in 70 Objects’, a community project running across the County Palatine to engage local communities in their history and heritage.